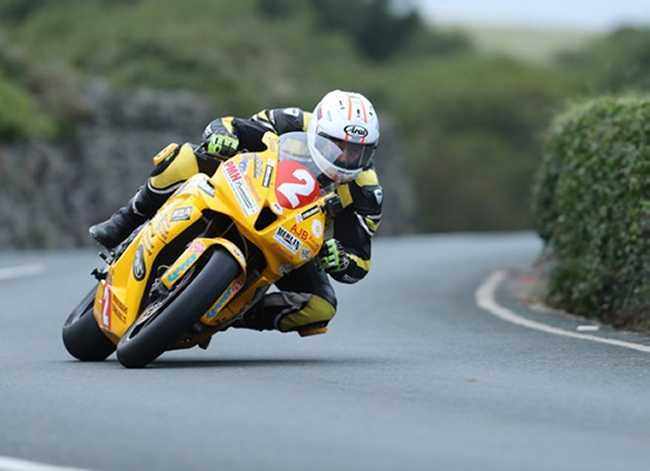 Brad Vicars followed in the footsteps of illustrious names such as Ivan Lintin, Michael Dunlop, Ian Hutchinson and Carl Fogarty in winning the Newcomers Manx Grand Prix Race, the opening race of the 2017 Manx Grand Prix. The first race of the 2017 Manx Grand Prix got underway on time at 6.15 after being delayed from the previous day. Jimmie Guthrie was the race starter and the Manx Grand Prix guest of honour, fifty years after he won the Senior Manx Grand Prix race. Riders across both the Newcomers A - primarily Junior 600cc bikes and B categories – Supertwin 650’s - lined up according to their fastest qualifying lap times, which saw some of the faster B riders going off the line ahead of some of the A category field. Based on their qualifying laps a three-way fight was expected between fight between Daryl Tweed, Brad Vicars and Andrew Fisher in the Newcomers A Category while in the Newcomer B class, Manx rider David Quine started the clear favourite based on qualifying times. As fastest qualifier Tweed from the famous road racing Ballymoney town in Northern Ireland, had the honour of being first away from Glencrutchery Road followed by Tadcaster’s Vicars and Fisher from Kettering, who lost a bit of time by stalling on the line as he was due away. However, news came through of a red flag incident at Braddan Oak and the bikes were brought back to the Grandstand under stationary yellow flags. The grid then reassembled and the race was restarted at 7.05pm. Rider Nicolo Capelli from who was involved in the incident was taken by ambulance to Nobles Hospital, a short distance away, where he was reported to be in serious condition with leg fractures but his condition was not thought to be life threatening at this stage. Vicars led the restarted race at Glen Helen by over five seconds from Fisher with Stephen Parsons holding third less than a second back and a second ahead of Tweed with David McConnachy from Northumberland, a further two seconds back, completing the top five. 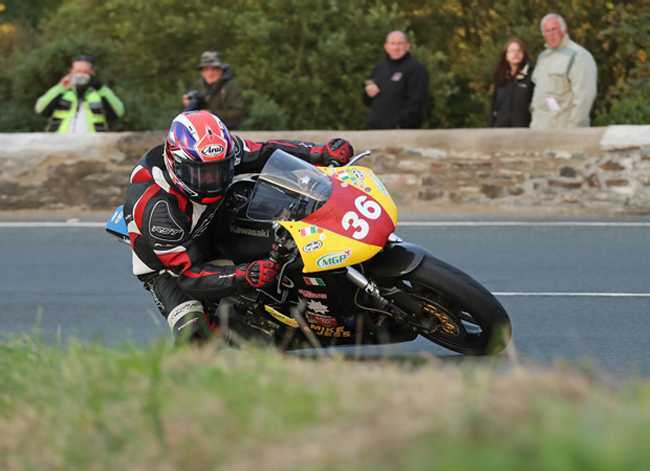 Darryl Tweed moved up into second place by Ballaugh but the gap to leader Vicars had grown to almost ten seconds with Fisher less than half a second behind the Ballymoney rider in third. Mike Norbury moved into the top five, behind Stephen Parsons but was already six seconds behind the fourth placed man. Vicars was first through the Grandstand with a stunning opening lap of 118.786 an MGP Newcomers lap record – from a standing start - breaking Tim Venables time from 2010. Tweed, who was also inside the old record, clocked 117.993 to trail Vicars by seven seconds with Fisher (116.303) third. Parsons (116.198) and Norbury (115.401) completed the top five. In the concurrent Newcomers B class David Quine had established a lead of almost nine seconds by the first timing point from Derek Wilson with New Zealand’s Ben Rosendaal only a tenth of a second further back. Quine extended his lead to over fifteen seconds ahead of Wilson by Ballaugh but the Manx rider went through the Sulby speed trap at only 60mph and retired shortly after at Sulby Bridge leaving Wilson the clear leader by five seconds at Ramsey from Rosendaal with Lee Bass a further nine seconds back in third. That remained the top three at the end of the first lap with Wilson’s 103.299 giving him a ten second lead from Rosendaal ((102.502) with Bass (101.334) holding third place. With the race reduced to three laps, Clerk of the Course Gary Thompson imposed a compulsory pit stop at the end of lap 2 to reduce the risk and confusion of inexperienced riders pulling out of pit lane onto oncoming bikes. Coming into the pits at the end of lap 2, Vicars’ second lap of 117.881 gave him a lead of over seconds from Tweed who posted a near identical 117.885 with Parsons now up into third place after a second lap of 116.518. Fisher (116.156) and Norbury (116.191) completed the top five. Vicars enjoyed a decisive pit stop and was timed at 37 seconds to Tweed’s 48 seconds to lead by seventeen seconds at Glen Helen on the final lap with Parsons a further twenty-one seconds back in third. That proved to be the order as the three crossed the line with Vicars taking the chequered flag in 116.464mph/ 58:18.785 from Tweed (116.168/ 58:27.728 with Parsons (115.270/ 58:55.047) clinching the final podium place. In the Newcomers B race Wilson second lap (103.467) gave him a thirteen second lead from Rosendaal (103.236) with Lee Bass (102.206) third. However there was drama with Wilson picking up a thirty second penalty for a pit lane infringement which meant that at Glen Helen Rosendaal was the new race leader almost ten seconds ahead of Wilson with Bass third. However Wilson fought back and was back in front at Ballaugh and duly took the chequered flag in a time of 101.703/ 1:06.46.619 from Rosendaal (010.495/ 1:06.54.816/) with Bass (100.062/ 1:07.52.309) securing the final podium place.